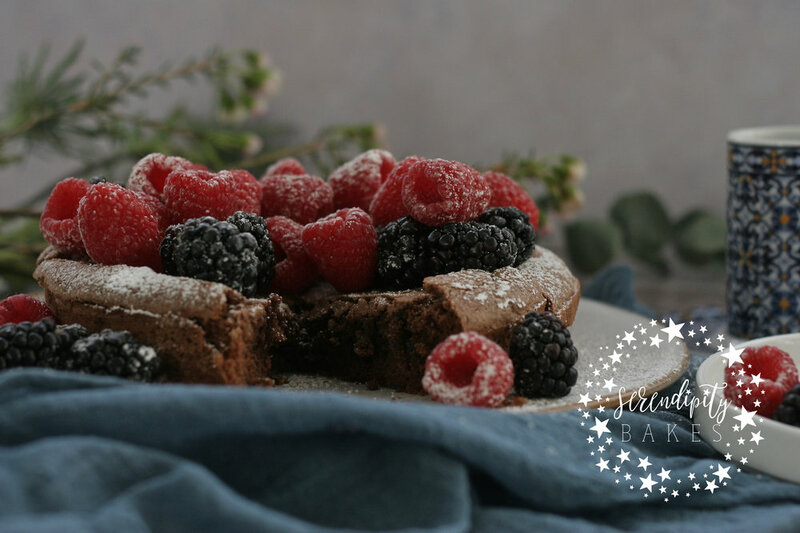 A simple but beautiful Kladdkaka chocolate cake, gluten free and perfect for sharing with friends and family for lunch or supper. Adorn it with berries and serve it with cream for an extra indulgent twist. Enjoy these mini cauliflower and spelt pizzas with all your favourite toppings. And best of all, they're completely gluten free! Panzanella has been the taste of my summer. Garlanded with the ripest of peaches, tomatoes and avocadoes, on a bed of the most delicious ciabatta and scattered with torn mozarella and parmaham rosettes. A wonderful base recipe for you to create your own personalised panzanella! The great thing about living in London (and one of my favourites) is that we're so close to amazing cafes, shops and restaurants within a stone's throw of us. It's perfect if you run out of some ingredient, fancy popping out for a drink with friends and we walk everywhere. The cafe culture has certainly given us fantastic eateries, delis and patisseries! This little roll is super tasty and is filled with a mixture of spinach and feta, rolled in a blanket of puff pastry and then topped with eggwash, parmesan and fennel. They are simple to make but are delicious and you can have them freshly baked on your table in next to no time. I've never been a fan of aniseed but the fennel really does add a lovely twist to these and with the parmesan, a perfect crisp exterior to the little rolls. We start by making the filling. I use frozen spinach and cook it in a small saucepan with a couple of tablespoons of water for around 5 minutes or until the spinach fully defrosts. Then we need to remove some of the water, so it's placed in a sieve and the water squeezed out by pressing the spinach against the sieve sides with the back of a spoon. Once we've removed most of the water, the spinach goes into a small bowl. The chopped feta is added and mashed together with the spinach using a fork. You're not looking for a puree consistency, but for it to be combined with small chunks of feta remaining. Next we season with a dash of nutmeg and a little salt and pepper. Once the filling is ready, we unwrap our puff pastry and lay it on a lightly floured work surface. The pastry needs to be cut in half horizontally to make two rectangles (each rectangle will make two rolls) and then half of the filling is laid half-way down, in a line horizontally across the first rectangle. The pastry is rolled up from the bottom side to the top to make a long sausage roll and then sealed with eggwash. This is then repeated with the second piece of pastry. When we all lead such busy lives, it's nice to be able to treat yourself to a tasty lunch which doesn't take too much time to prepare but which has lots of amazing flavours and is freshly baked. And if you're working away from home, the rolls can also be made the previous day ready for you to take with you. Nothing's better than one of these rolls on the run! Do you ever walk into a cafe and see the wonderful display of cakes and muffins and think, "I could make that?" I'm always wondering how I could make the things I see every day and have been wanting to try crustless quiches for some time. So today I got to rustling them up for my lunch. Think of them as a crustless quiche or eggy muffin -- they're a cross between the two, I think. They can be made with the ingredients you yourself love or whatever you have to hand. I wanted to make mine from broccoli, ricotta and feta as the main flavours. The mixture takes ten minutes to make and then they bake for thirty minutes in the oven so are super quick to turn around. They are perfect for a simple supper served with a salad or a lingering brunch with friends. I was so in love with them, I just ate two, but sssshhh -- just our little secret! Experiments often don't work out the way you want the first time, but these are perfectly delicious. I only made three but have scaled up the mixture below to make six. You can make as many as you like but work with one egg per muffin and scale accordingly. I started by cutting the broccoli into tiny florets and put them in the base of the muffin holes -- when they're cut so small they cook perfectly and come out lovely and tender. Then the egg mixture is made with egg and ricotta, whisked until they're smooth and then seasoned with a little salt and pepper to taste. On top of the broccoli, I put some crumbled feta and the poured over the egg mixture. Then on the surface of them, I gently placed a few more pieces of feta and a couple of dollops more of ricotta -- and sprinkled them with chives. They bake for thirty minutes and arrive from the oven all lofty and puffed up. They quickly deflate which is no problem as these are quiches and not soufflés and I served mine warm from the oven. I'm often eating scraps for lunch whilst everyone is away at school and work and it's sometimes difficult to feel inspired. When these are so simple to make and with so few ingredients, it's not difficult to give yourself a treat now and again, is it? I love having dinner parties. I also love going out for dinner, but I think there's something very special about inviting friends into your home and planning a menu they'll enjoy, then cooking it for them. I am totally up for designing complicated menus (like making chocolate soufflés to order after the main course) but I think there's a lot to be said about taking the time to really enjoy the company of your friends. And that takes a menu where at least a couple of courses can be planned and prepped in advance so that they just require baking time when your friends are with you. I was looking for vegetarian inspiration and came across this wonderful Twice Baked Roquefort Soufflé which I've only made once before (and that was more moons ago than I care to think of) from Delia Smith's Vegetarian Collection. What I love about it is that it can be prepped 24 hours in advance with its first bake and then finished in the oven 30 mins before it's due to be served. And it still retains its soufflé appearance and texture. Delia also has a goat's cheese version too. The process of preparing it requires working at speed. I really recommend when making this that you have all your ingredients weighed out separately so you can just reach for this or that as required. You don't have time to be weighing out ingredients or crumbling roquefort once you've started. But the process is straightforward as long as you follow the timings below. Although the oven timings should work, keep an eye on the soufflés as they approach the end of the cooking period as they easily burn. The resulting consistency should be firm on the outside and slightly soft and velvety in the middle. I promise you that if you want to wow your guests with something as special as a soufflé, this is a brilliant recipe for you. The hard work is all done in advance and the stress of trying to pull together something as seemingly complicated as a soufflé when your friends arrive and are chatting away with you is completely removed. The light texture and resulting soufflé is every bit as good as the best restaurants. Shall I now let you into a little secret? Having thought they would be completely tricky to make, they're actually pretty simple. And yummy. And the satisfaction from making them yourself... I did cheat a little though. I was chatting to our local butcher the other day about how to make the meat filling and he convinced me that I should invest in a jar of ready-made Char Siu Sauce (I used the Lee Kum Kee brand as it was available in my local supermarket). I um'd and ah'd about not making it myself, but I wanted to see how successful the process was first - and actually the sauce is so delicious that I would definitely use it again! The start of the process is preparing the meat. I used 300g pork loins and marinaded them with the sauce for an hour (a lot of recipes suggest overnight so you could also do this if you prefer). Then I popped them in the oven and cooked them for around 25 mins. When they were cooked I smothered them in more of the marinade (I swear if you try this stuff, you'll want to use as much as possible!) and left it to cool down. Then cut it into cubes. You can do this the day before. When I came to use the meat, I felt it still a little chunky so I blitzed it in the food processor for 30 seconds to break it down a little more and the texture was perfect for these buns. The making of the dough is pretty simple. There are recipes with yeast but I decided to work with one from taste.com.au which makes the dough from flour, baking powder, caster sugar, salt, water and vegetable oil. All very simple and after mixing together the dry ingredients, you add the water and oil and stir them together until you have a sticky dough. Knead this for around 5 mins on a lightly floured surface and you have your lovely bun dough. It needs to be refrigerated for an hour and then it's ready to use. When you come to make your buns, the dough should make around 10 average size buns so I worked out the total weight and then calculated how much dough each required to make 10 of them. Then you want to lightly flour the surface and roll each dough portion out to a 12cm round. The dough of the first buns I steamed were a little thick so do try to roll them out as thinly as possible. The buns also dry out quickly so cover them with cling film whilst you roll out the others. Place a dollop of meat in the middle of the circle and then pull up the sides to make the bun, pinching the dough at the top. 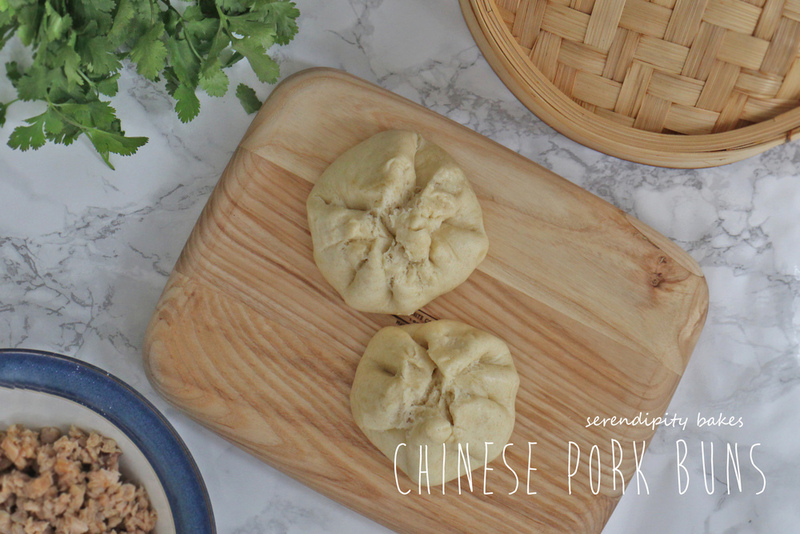 I steamed my pork buns with a bamboo steamer. One of these over a pan filled with 1/3 boiling water and cook them for around 15 mins. As my meat was pre-cooked I didn't have to worry about it being cooked properly, but you want to ensure that the buns are fully cooked by inserting a bamboo skewer in the middle which should come out clean. These buns take a little more effort than buying them ready-made, but they really are delicious and you can flavour them however you like. I used a lot of the Char Sui Sauce as I really loved the flavour of it and of course, you can use any meat or vegetables you like in them.